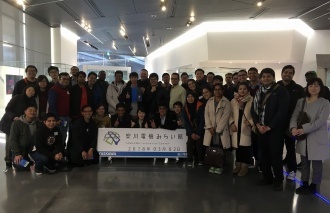 41 Kyutech International Students from 14 countries had a field trip in Kitakyushu City on March 2nd, 2018. 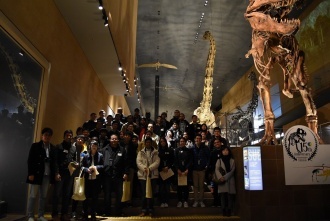 The group visited Kitakyushu Museum of Natural History & Human History, YASKAWA Electric Corporation, and Kitakyushu Environment Museum. At first, in Kitakyushu Museum of Natural History & Human History, the students tried the quiz which was related to Kitakyushu area. It was quite hard for them to seek the answers throughout the museum which was larger than they expected. About 10 students found all the answers while many of them gave up, and one of them got the perfect answers. The group visited YASKAWA Robot Village next, and had a tour of Innovation Center, Plant No.1, and No.2. 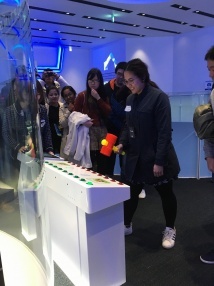 At Innovation center, the students enjoyed games with robots and experienced the leading-edge technologies. During the factory tour, the students learned the process of how the robots make robots and sometimes asked questions eagerly to the guide. 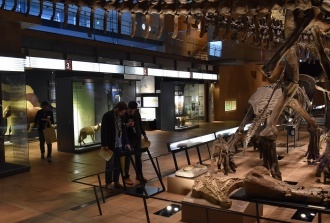 They visited Kitakyushu Environment Museum at the end, learned how Kitakyushu City overcame the pollution and became a Green Growth Model City checking the displays and diorama of the life back in 1960s. 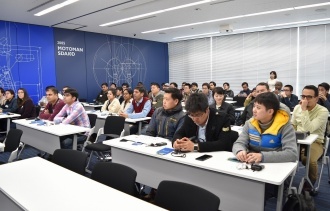 It was a good opportunity for international students to know the history, culture, and technology from time immemorial to the present day of the local area where they spend their lives in Japan.